Master and Dynamic Heaphones Reviews - Is it a Scam or Legit? Master & Dynamic headphones provide high-quality sound & feature expert craftsmanship and attention to detail, including stainless steel construction and more. Do you listen to your music passively? Or, are you passionate about audio, only interested in top-notch gear that can produce radiant, crystal clear sound? If you fall into the latter camp, Master & Dynamic Headphones might be your key to audio bliss. Why? Master & Dynamic is a premium audio company that manufacturers high-end over-ear, on-ear, and in-ear headphones, earphones, and sound tools that meet at the “intersection of form and function.” And because of their focus on quality, you’ll find that each of the headphones in Master & Dynamic’s lineup is tuned for a rich, warm sound, appointed with the finest materials and finishes, and complemented with functional details. Whether you’re a newly-minted audiophile in the market for your first pair of high-end headphones, or you’ve been collecting and testing various gear for decades, you’re here to find out 1) all the details you can about Master & Dynamic Headphones, and 2) whether you should shell out the money and buy a pair. To help you make an informed decision, we’ll cover most of the important aspects in this review. To kick things off, let’s take a look at Master & Dynamic’s lineup, as well as what separates them from the competition. On top of this, Master & Dynamic’s parts are easily replaceable, while bringing out the fine details of recorded music, regardless of your genre and taste preferences. Within their lineup, Master & Dynamic offers six different models: MW60 and MH40 over-ear headphones, MH30 on-ear headphones, and the ME05, ME03, and ME01 earphones/earbuds. On top of this, the company also offers a variety of accessories, including boom mics, stands, replacement ear pads, and cables. Now, the million-dollar question: How much will all this quality craftsmanship cost you? Are Master & Dynamic’s Prices So High You’ll Pop Your Eardrums? Each of Master & Dynamic’s headphones come in a variety of color options, and are priced between $329 and $549, while some special edition models are priced as high as $1,200. However, the company’s earphones are priced lower, between $129 and $199, while accessories range between $29 and $129. Note: Master & Dynamic’s headphones are also available through Amazon, Apple, Crutchfield, and many others third-party retailers. If purchased directly through Master & Dynamic, your headphones will come with free shipping and free returns within 30 days. If you live in New York City, you’ll also be eligible for same day delivery. Regardless of where they’re purchased, all Master & Dynamic headphones and earphones come with a 2-year warranty against defects in materials or workmanship. In order to request a refund or to process a warranty claim, you’ll need to call customer service at 888-814-5411. Considering the high cost of Master & Dynamic headphones, are customers pleased? Do they think they’re worth the price? What Are Customers Saying About Master & Dynamic Headphones? On Amazon, most of Master & Dynamic’s products seemed to have between 4 and 5-star average ratings. For example, based on 54 customer reviews, the MH40 had an average rating of 4.2 stars. Common compliments cited attractive design, high quality components and construction, and warm sound, although common complaints referenced that they were uncomfortable and priced high. Overall, we found much of the same feedback for all of Master & Dynamic’s over and on-ear models. Lastly, Master & Dynamic’s ME01 model had two Amazon customer reviews at the time of our research, which noted their sleek, modern look, and that the flat cord doesn’t tangle. Elsewhere online, CNET provided an in-depth review of Master & Dynamic’s MH40 headphones and gave them an overall rating of 4 stars. There, they noted the high-quality (but fairly heavy) construction and the highly detailed yet never-harsh sound, noting that it stacks up well against other audiophile headphones in a similar price range. In fact, the only drawbacks noted were that the mid-range (specifically vocals) could be a little richer and that not everyone will appreciate the fit. We’ll come back around to this in the final section. Given these fairly high ratings, how well do Master & Dynamic headphones stack up against the competition? Is Master & Dynamic a Better Choice Than the Competition? An audiophile is defined as “a person who is especially interested in high-fidelity sound reproduction.” And in order to achieve this high-fidelity sound, audiophiles will often spend thousands of dollars on high-quality equipment that can reproduce sound as close as possible to the original. To this extent, there are literally hundreds of audiophile-worthy headphones out there in all kinds of price ranges. This probably isn’t news if you’re a died-in-the-wool audiophile, but could be useful information if you’re new to the industry. In fact, you can see just how many options you have by typing “audiophile headphones” into your favorite search engine and watching how many results pull up. Headphones.specout.com also provided side-by-side comparisons (basic details only) stacking the MH40 against the Bose Quiet Comfort 25 and the Grado Prestige SR325e. With all of this laid out, what’s the bottom line about Master & Dynamic headphones? Should you go ahead and splurge on a pair? Who Will Benefit Most From Master & Dynamic Headphones? Any way you slice it, $129-$549 is a lot of dough to spend on a pair of earphones or headphones. However, if you’re accustomed to using high-end audiophile gear or are looking to start collecting, then these prices might be viewed as reasonable, considering how much you could pay on some of the competition. Which brings us to the main point: If you’re a casual listener (while on the way to work, when working out, etc.) and haven’t yet developed a well-tuned ear, you might not be able to appreciate the improved sound quality provided by Master & Dynamic’s headphone; at least, not in relation to their high price. In this instance, you might be better served by a more traditional, lower-priced brand. Also, keep in mind that regardless of the headphones you choose, they will only reproduce sound that matches your file quality. In other words, if you’re not starting with a lossless, uncompressed file, then even thousands of dollars worth of equipment won’t help (or, at least they might not provide a solid return on your investment). Finally, keep in mind that—whether you consider yourself an audiophile or not—sound and fit are largely based on personal preference, and what one person finds ideal and comfortable, another might find the exact opposite. However, based on customer feedback, Master & Dynamic headphones might apply too much pressure to the top of some users’ heads, making them uncomfortable. Did you splurge on Master & Dynamic headphones? Tell us all about your experience by writing a review below! 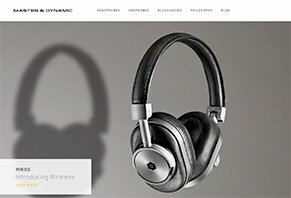 Write a Review for Master and Dynamic!